Fireproof. Considering buildling in a forest or other places vulnerable to fire? Hurricane and storm proof with adequate foundations and engineering. Considering building your home in coastal areas or where tornados are a risk? Lowest maintenance possible. No paint on either side of the wall is required. Both sides of wall finished when installation is done. The "skin" or finish is complete without the need for another trade or material. All other construction concepts have walls that require "sandwiching" layers of different materials. Architectural details already on components rather than being added (exceptions are complex sculptures that take more time to do and they may be added later with stainless steel pins and epoxy glue). This includes a cornice with a projected profile, with entablature and soffit extension as required. Durability against the elements. 4,000 psi mix with rebar and strux reinforcement. Highest R value, as much R value as desired. Any R value you want is possible with modifying the thickness. DAC-ART can be any thickness and any R value on demand. Cornice. Incomparable concrete (stone) cornice. No other construction system offers a comparable cornice with the beauty and strength of a DAC-ART cornice. 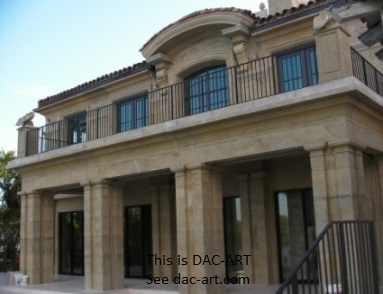 A DAC-ART cornice includes a projected profile, with entablature and soffit extension as required. Provides fine interiors by design, material and the fact that both sides of DAC-ART are finished. No additional layers of materials or coatings are needed. This criteria was based on Theodore Dial's love and study of limestone (calcaire) in France where one can still see the inside surface the same as the exterior side. If a different finish is desired on the inside, plaster or any version of badigeon may be applied directly to DAC-ART without other steps in the construction process.. 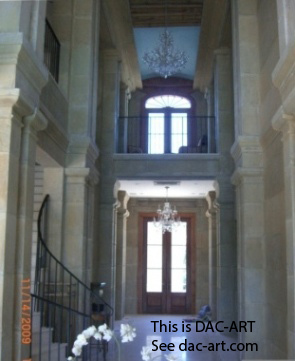 The beautiful stone wall interior above shows how the inside of the same DAC-ART gives the inside finish and details without adding additional materials. No Need for Additional Interior Finishes, unless another finish is desired. In addition to the skin of the wall, the interior side of the DAC-ART wall is formed to give all the desired moulding, cornices, bases, crowns, etc that Dial designs. This adds immensely to the uniqueness of each home. 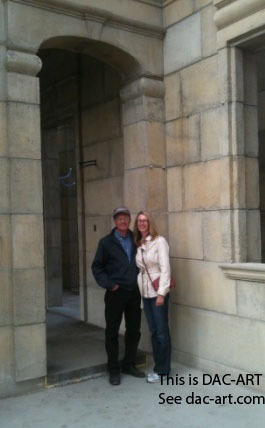 Théodore and Renée inside the Colbert's DAC-ART home with the stone interior exposed. Heavy Duty, custom concrete components with a large cavity to fill with solid concrete matrix to lock it all together. Moulded "baseboards," door plinths (shoes), casings on top of the shoes that will continue up on the door openings.